He will test believers by putting them through difficult training that will both strengthen them and reveal their current conditions (like a refiner’s fire). Intent means everything. If I as a leader demanded that my followers run until they threw up, forced them to work for me in grueling circumstances to the detriment of their bodies, and humiliated them continually to destroy their hearts, I would be a monster. If I did it for their best interests, I would be a drill instructor. If I rubbed acid on someone’s face so that it bubbled and hurt, and the person had to take meds for weeks just to deal with the burns I created, I would be a devil. If I did it because the person asked me to, I would be a dermatologist performing a chemical peel. If I dropped heavy items on you that could crush you, only to force you to catch them and push them back up, I would be a tormentor. If I did it for the good of your body, I would be a personal trainer in the gym. If I withheld your normal food for days on end and then only gave you small amounts of berries and vegetables even though there was a bounty of food around, you would call me selfish. If I did it for your health, I’d be a nutritionist helping you with a fast or cleanse. As you can see, it’s not the brutal situation that makes something good or bad, but the motive behind it. That’s also true of troubles in our lives. Satan seeks to harm. He wants to take us down. He wants us to turn our back on God1 and sin.2 Satan and his demons want to rip our faces off; the only reason they can’t do that is because God holds the leash. Why doesn’t God stop them completely and keep us safe? Because safe isn’t the pathway to either strength or revelation. God’s intention is always for believers to emerge from a trial better than when they started, either in strength or in knowledge. He promises that every situation will have a way out — an escape hatch that can be utilized through obedience.3 The way out may not be easy, and we may not always take it, but its presence means that we will never be forced to sin. God will never do that. Jesus came out of the desert trial more powerful than He was before. He underwent temptations at the beginning of His public ministry so that His power would be present for His work. Obedience results in power. When we emerge from a trial successfully, not only is God glorified, but also we are strengthened in confidence and in the certainty of God’s will for our lives. The Holy Spirit comes in and fills that empty spot (where we empty ourselves of our pride, our needs, our cravings, or our agendas) with Himself, and we are empowered even more. God brings trials to our lives for this outcome. 1 John 4:9-10; Ephesians 2:4; John 15:13; Romans 5:8. Excerpted with permission from The Master’s Mind by Lance Hahn, copyright Lance Hahn. 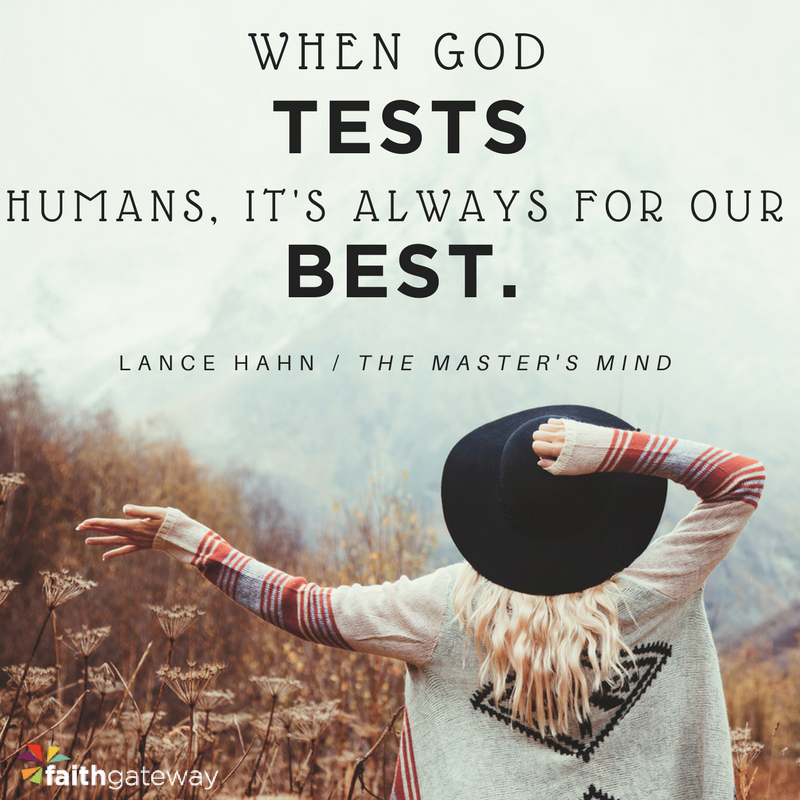 Lance Hahn is the senior pastor at Bridgeway Christian Church in Rocklin, California. A longtime teacher of the Bible who loves digging into history, context, and original texts, he is wildly passionate about God and people. Lance played drums as a founding member of the band Jesus Freaks. He is married to Suzi, and they have two daughters, Jillian and Andie. For more about Lance, including a video of his testimony, visit askpastorlance.com.